April 24th 1916 - May 10th 1916. The departure and journey of six men in the lifeboat James Caird from Elephant Island to reach South Georgia 800 miles away. The voyage of the James Caird. 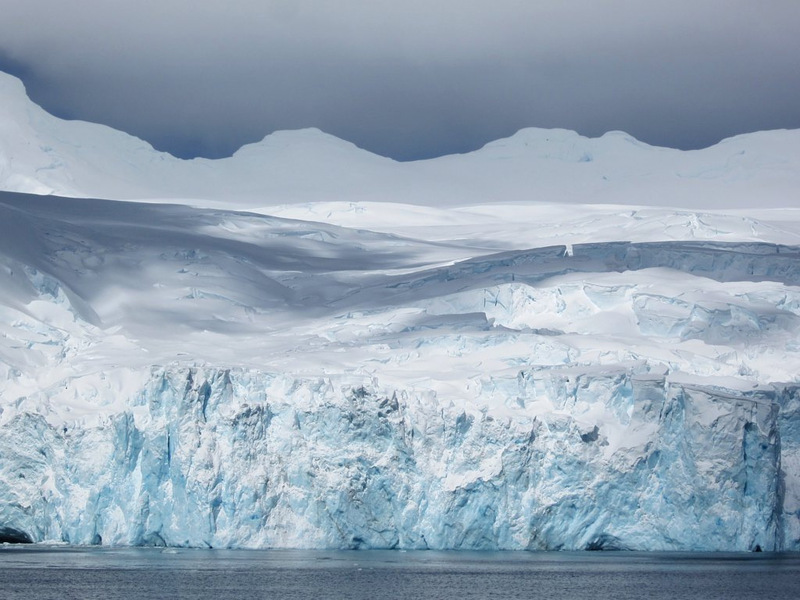 Mountainous seas in the southern ocean made this one of the most incredible small boat journeys of all time. 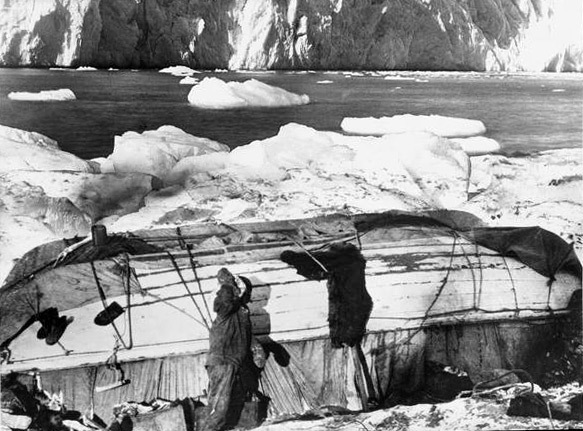 The "Snuggery" the upturned lifeboats used by the men left on Elephant Island on top of small rock walls and proofed against the weather by tarpaulins and other cloth remnants. 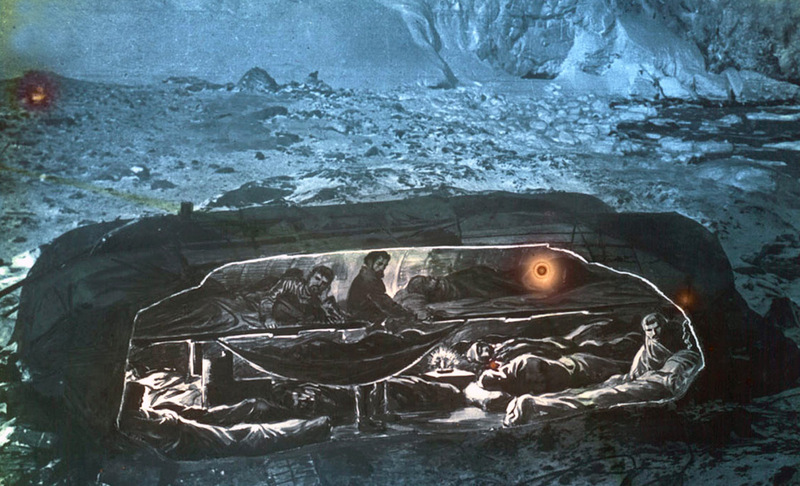 The "Snuggery" composite picture, photograph of the outside with an artists impression of the arrangement of the sleeping quarters on the inside. 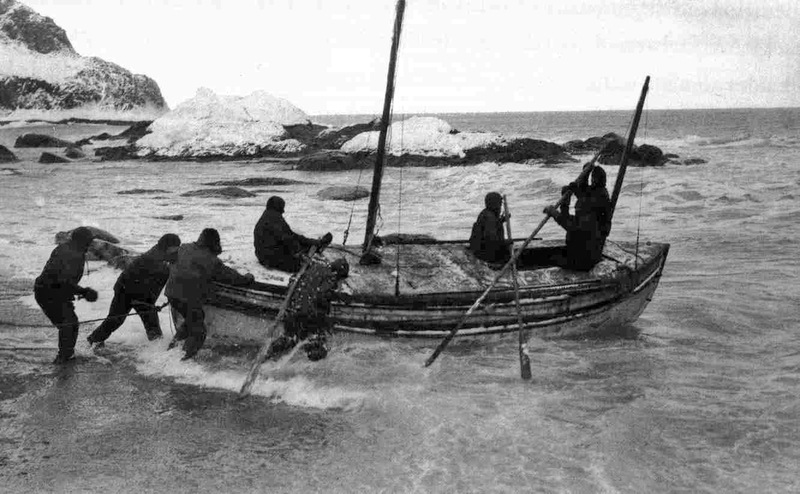 The James Caird made progress at the rate of around 60-70 miles per day through rough sea conditions. The sea constantly came in and made everything including the sleeping bags wet, it was difficult to find any warmth at all. There were four sleeping bags made of reindeer hide which shed their hairs in the constant dampness, making them less effective and clogging the pump used to empty the sea water that spilled over into the boat. The boat was relatively unladed and so boulders and other ballast had been placed aboard in order to trim her, these had to be constantly moved around. The weather worsened and they encountered fierce storms, As the temperature dropped, ice formed on the outside of the boat from frozen sea spray, up to 15 inches deep on the deck. This made the boat much heavier and affected the trim - more moving around of the boulders - the men also tried as far as they could to chip away the accumulated ice with any tools that they could improvise, though the situation worsened. They began to throw items overboard in order to save weight, the spare oars went as did two sleeping bags that by now were soaked through and hard and heavy with ice. At other times they had to bale out water for dear life, the only solace during this journey were hot meals every four hours by the light of a primus stove. They had been drifting for some time under light sail held back by the sea anchor due to the sea state (a sea anchor is a sort of large canvas bag that acted to slow the boat and prevent it from being tossed around quite so violently during stormy seas). The sea anchor however was lost as the boat fell into a large trough between waves and the men then had to beat the canvas sails free of ice and set them again properly in order to keep on course. Frostbite was beginning to affect exposed fingers and hands in the cold and constant wet. Navigation was also a problem due to the continually overcast weather. 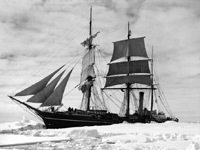 On the seventh day at sea however a break in the cloud came and Worsley was able to take a reading from the sun, six days since the last observation, he calculated that they had traveled around 380 miles and were almost half-way to South Georgia. The short period of sunshine meant that the men were able to spread their clothing and other gear over the boat deck and the mast to dry out. 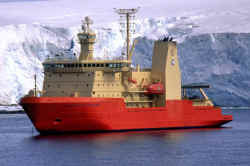 The ice became less dense and they occasionally were accompanied by wildlife, porpoises and tiny storm petrels. "I called to the other men that the sky was clearing, and then a moment later I realized that what I had seen was not a rift in the clouds but the white crest of an enormous wave. During twenty-six years' experience of the ocean in all its moods I had not encountered a wave so gigantic. It was a mighty upheaval of the ocean, a thing quite apart from the big white-capped seas that had been our tireless enemies for many days. I shouted 'For God's sake, hold on! It's got us.' Then came a moment of suspense that seemed drawn out into hours. White surged the foam of the breaking sea around us. We felt our boat lifted and flung forward like a cork in breaking surf. We were in a seething chaos of tortured water; but somehow the boat lived through it, half full of water, sagging to the dead weight and shuddering under the blow. We baled with the energy of men fighting for life, flinging the water over the sides with every receptacle that came to our hands, and after ten minutes of uncertainty we felt the boat renew her life beneath us"
On May 7th Worsley again was able to take a navigational reading and reckoned that they were not more than a hundred miles from the northwest corner of South Georgia, another two days with the wind with them and they should have the island within sight. 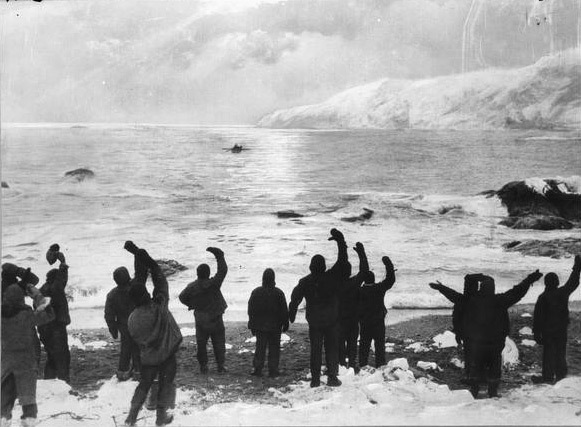 On the morning of the 8th of May, they began seeing kelp floating in the sea, then some sea birds, just after noon they caught a glimpse of South Georgia, only fourteen days after leaving Elephant Island and about half as long as they thought the journey would take. Landing was to be a less than straightforward affair, reefs (shallow rocks just below the sea surface) stretched all along the region of the coast where they were and great waves broke over them. The rocky coast in many places descended steeply into the sea. Despite being so close and running out of fresh water to drink, they had no choice but to wait for the next morning to break before attempting to land on the shore. 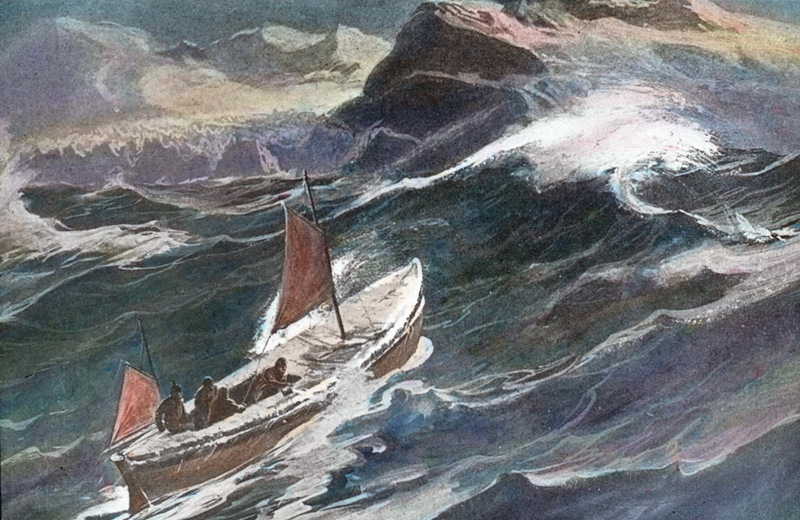 The morning brought a shift in the wind and a terrible storm arose, the James Caird was tossed around in the sea and when light broke, they were out of sight of land once again. They made their way back to South Georgia just after noon, but again, it was a coast of huge breakers and sheer cliffs that greeted them. The day wore on and there seemed no hope, later though in the evening, the wind shifted direction and began to die down. By the morning of the 10th of May, there was very little wind and they were able to look for a landing place. Reefs and breaking waves dogged their every attempt. They found a likely bay to land, but were blown out to sea again by a change in the wind. 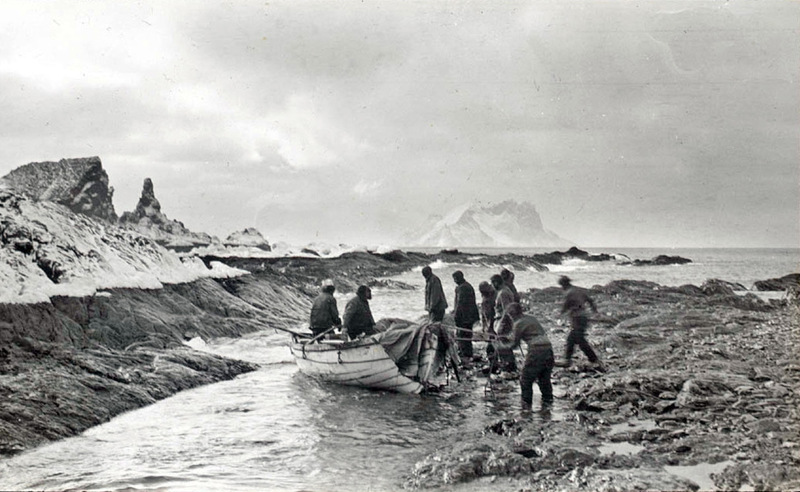 In approaching darkness they eventually were able to enter a small cove fronted by a reef, they had to take in the oars to pass through, but at long last, carried by the swell, the James Caird was able to land on a South Georgia beach at King Haakon Bay. 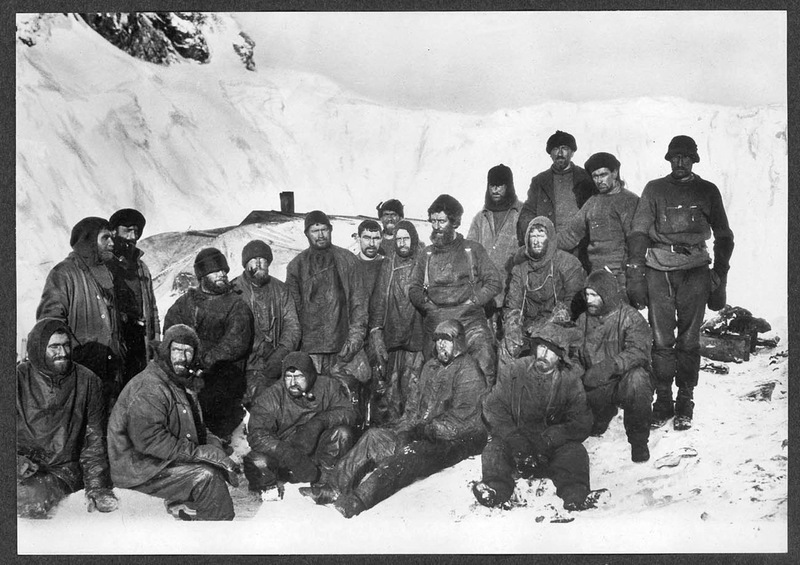 They had got through thanks to Shackleton's leadership and the incredible navigational skills of New Zealander Frank Worsley. Worsley had only been able to take sightings of the sun four times, on April 26th and May 3rd, 4th and 7th, all the rest had been dead reckoning, keeping on the same straight line in the same heading. Had they failed to land, the boat would have been swept onwards to be lost in the mid Atlantic, and no rescue party would have set out for the men on Elephant Island. Picture credits, copyright pictures used by permission: Point Wild Glacier - by David Stanley from Nanaimo Canada, used under Creative Commons 2.0 Generic license.